Abhijit Auto Agency (India) Pvt.Ltd. 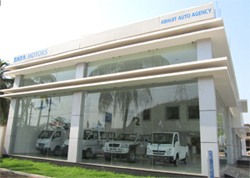 is a registered private Ltd company running the TATA Motors Commercial vehicle dealership located at Guwahati having 3(S) facility (Sales, Service & Spares). Showroom: Our state of art showroom has a 3000 Sq Ft of Vehicle display area and 10,000 Sq Ft of back office equipped with all the modern facility. Workshop & Spare: Our state of art workshop has 12 bay with 5500 Sq Ft of back office with all the latest tools and machinery for better repairing. The facility for repairing and servicing of all range of Buses, Trucks and passenger carriers is available. For spare parts there is a complete separate wing for storage and sales of spare parts. The Company has all the range of SCV (Small Commercial Vehicle), LCV( Light Commercial Vehicle), ICV (Intermediate Commercial Vehicle) and Passenger Carrier (Buses,Magic,Winger) for Kamrup, and district of Goalpara, Morigaon & South Dhubri. The board of Directors of the Company compromises of Shri Vijay Kumar Jasrasaria, Managing director and Shri Abhijit V. Jasrasaria, director who are the well established, reputed and dynamic business man of northeast. They are involved in various other industry apart from automobile.